"There are no weeds in nature, just as there are no peasants. Civilization and cultivation have created both." With the days getting longer and warmer I decided to look through a book I picked up at a thrift store this winter. I like haunting the bookshelves at thrift stores because you can find all kinds of books but my favorites to come across are gardening books. Sometimes they're new but mostly they're older books. This book for example was once in the collection of a J. M Janoski and was printed the year I was born. It's in really good condition and I bought it for forty cents. 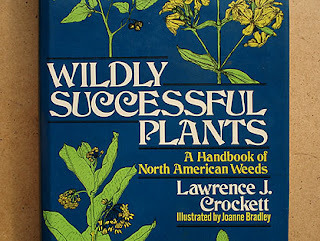 I picked up this book because I wanted to identify the weeds that grow in an empty lot here in Chicago. The owners of the lot were responsible and paved the lot with gravel and fenced the area in. But sometimes they forget to cut down the weeds and after a particularly good rainfall the lot explodes with life. If you put your face up to the fence to observe the butterflies and bees jumping from flower to flower and concentrated really hard you could almost imagine what Illinois was like before we came around and developed it. Being a city boy the only birds I've ever really noticed here were the pigeons and the English house sparrows and the countless owls,swans and flamingos all made of plastic but twice last year I saw birds there that I'd never seen before. At night if you pass by this lot you may laugh at the crickets trying to shout over the sounds of the city. Perhaps as a gardener you'd appreciate the lone yellow tulip that grows in this lot. A garden escapee or perhaps survivor of a long- lost garden? While I love tulips I wasn't a fan of this particular tulip because it always seemed to be trying too hard. I loved it when someone finally fell victim to it's need for attention and slid their hand into the opening near the fence and plucked the bloom and allowed for the natural balance of the lot to be restored. I had planned to take a lot of photographs of the lot this year and with the help of this book attempt to identify everything that grew there. It's taken almost ten years for the plants to fill out and for a variety of things to grow there in a way that makes all of the restoration gardens in Chicago seemed contrived. I should have started to do this a year ago because today it dawned on me that the lot is now paved over and there's a mini strip mall in it's place. It only took a couple of months for progress to undo what it took nature almost ten years to accomplish. Oh well, I know the weeds will be back someday maybe in another spot but they'll come back. They always do, that's why we call them weeds. Sic transit gloria mundi! And I agree that weeds make a city a much more beautiful place. Knölklocka (sorry, no english name, but the plant has bellshaped violet flowers) and nunneört (dito, plant has a cluster of yellow flowers and light green leaves) makes living worthwhile in Uppsala. Thanks for stopping by. I've been to your blog a couple of times and I like it. Maybe the "Knolklocka" is Campanulaceae? I really like that plant and tried it from seeds last year but I don't remember if they germinated. And maybe your 'nunneort" is Corydalis lutea? That Corydalis is very nice I'd never seen it before, thanks for bringing it to my attention. "The weeds will all be back..."
All but that sadly determined tulip. I like the tulip the best - such determination in the face of adversity. And a tulip plant that returns! That in itself is a rarity. I like your blog a lot. I love weeds too, su pequeña perfeccion geometrica. If you like chek my site too. 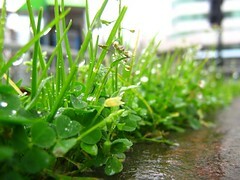 Is about weeds in urban spaces. Bienvenido a mi blog. I love that your blog and google page is dedicated to weeds. I had set up a separate blog in the hopes of cataloging the weeds in this particular empty lot but now that they're gone I don't know what I'm going to do with that empty blog. Maybe I'll do something like yours and just take photos of weeds I see around the city. I'm glad you stopped by because I was looking for an example for a blog entry and your blog and site are just what I had in mind. This reminds me of a discussion that took place a year or two ago where people were saying certain plants were weeds or not weeds and someone ended the discussion by saying, "If you like it and want it, it's a plant. If you don't like it and it's in the way, it's a weed." I remember one of the examples used was dollarweed. One person grew it in a pot and loved them while several were saying that they were invasive and taking over their yards. bullsh!t tulip! but a great and endearing story all the same, here's to succesful plants!